This private, spacious, comfortable home, with a wonderful,'big' backyard is situated in a quiet Skaket Beach neighborhood, only a 5- minute stroll to a beautiful bay beach. This 3,736 square feet home offers sunfilled living spaces in an open downstairs floor plan, including a kitchen, dining room, and two comfortable living rooms. You will find room to gather and spaces for spreading out. Each of the four bedrooms has its own bath. 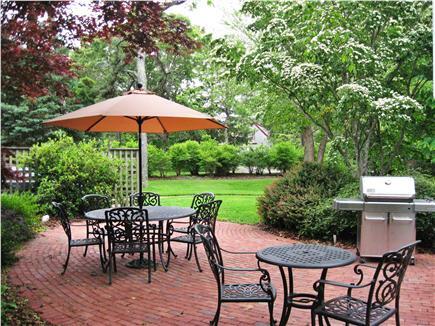 This home, which is centrally air conditioned, provides all the comforts of home on beautiful Cape Cod. Orleans will welcome you with fabulous restaurants, both Bay and Ocean beaches, Cape Cod Playhouse Theatre, bowling, great downtown shopping and The Cape Cod baseball league home team – the Cardinals. From our property, you can walk five minutes to a beautiful, vast private beach which neighbors the family friendly Skaket beach. Walk for miles, look for natural treasures at low tide or swim at high tide. Queen bedroom with full private bath, cable television. Queen bedroom with extra twin bed, cable television, large closet and full private bath. Downstairs bedroom with two twin beds, fireplace, cable television. This bedroom adjoins the second family room and full bath. For the adventurer – drive less than ten minutes to Nauset Beach for ocean side surf and excitement. Here you will find lifeguards, concessions and delicious restaurants nearby for pizza, great deli sandwiches and ice cream treats. For upscale dining, we encourage you to reserve a special evening at The Captain Linnell House or Abba. For family fare – enjoy The Lobster Claw or The Land Ho. Dining in? Buy fresh fish at Nauset Fish and grill or broil in our modern, fully equipped kitchen. On rainy days (they can be fun too!) go bowling or take a quick 10 minute drive to East Harwich movie theatre. Downtown Orleans hosts the town library with story times for children. Hyannis is 35 minutes away with day trip ferries to Nantucket and Martha’s Vineyard. In Hyannis you will also find endless shopping at the Cape Cod Mall, movie theatres and restaurants. Alexis’ home was just right for our family vacation. We had 3 families, including 3 grandparents, 4 parents and 3 young children. There was plenty of room for us to gather together or for time alone. The kitchen is larger than it appears in the photos and it’s well stocked. There was even a welcome bottle of wine waiting for us! The living room and dining area were also very spacious. The bedrooms were great, each having its own bathroom. However, the bathroom for the first floor bedroom was off the kitchen but close to the bedroom. The large yard was great for the children to play in. The patio was also a nice retreat. There were beach toys and beach chairs for our use. The beach was great, but the walk was a little long when carrying beach chairs toys and the grandchildren. It was about 15 minutes to the beach which normally would be fine. However, the last part of the walk was through sandy dunes and our wagon didn’t do well in the soft sand. So we had to carry everything. I do recommend bringing bug spray as there were lots of mosquitoes in the yard, even in the daytime. That said, I can’t fault Alexis for that. This is a great house in a great location! Walking distance to a private beach and/or Skaket. Spacious, clean and well appointed. Can easily accommodate a large family or two small families. We were a party of six with 3 teenagers and everyone had plenty of privacy. Owner on site and readily available to answer questions. We thoroughly enjoyed our stay! The second time renting this home was as good as the first! Home, complete with sand toys ready for the beach! The owner was professional, friendly, and answered every advance question rapidly, thoroughly. She contacted me a few days prior to arrival to set up the rendezvous to turn over keys and explain the home in detail. We found the house impeccably clean, stocked with basics such as tp, spices, oil, a welcome bottle of wine and a well-outlined document describing the amenities and the neighborhood. The home is located on a lush green property (we actually held an on-site outdoor yoga class on the lawn, watched Bambi and her mom, and various critters mostly small) a VERY VERY short walk to a part of Skaket Beach that has very few visitors. We loved it. The wonderful outdoor shower helped wash the sand off, and voila, ready to sit in the shade and read our books. Our family recently stayed at this home. It was spacious, clean and had everything we needed to enjoy our time there. We loved how close it is to one of our favorite beaches. We would not hesitate to stay again!! This past year marked our 3rd year staying at this property and we already booked for next year. We enjoy the spacious home and outdoor patio where we enjoy our adult beverages. There are plenty of nice restaurants nearby. Skaket Beach is a mile away and is a perfect spot to watch the sunset. Alexis is always available should you have any questions. 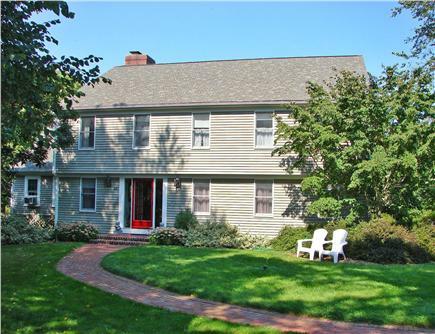 Wonderful Cape Cod rental! The house is beautiful, clean and spacious and so is the surrounding property. With little kids, we loved being a short walk down a little dirt road to a lovely bay side beach. We would happily return to this rental in years to come.